I am currently developing a new line of artisan soaps using the artwork of various artists. 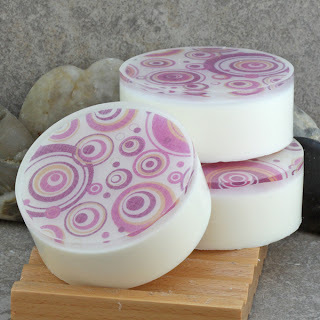 This beautiful artwork is printed on water soluble paper that is then embedded into a layer of clear soap to create these unique, one of a kind designs. 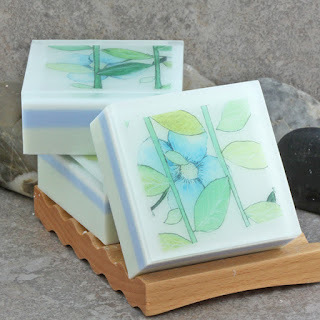 These soaps are complimented with coordinating fragrances and layered colors. These soaps will be wonderful as gifts or to decorate a guest bath - and best of all, they can be used! The water soluble paper dissolves as it comes into contact with water and washes away. 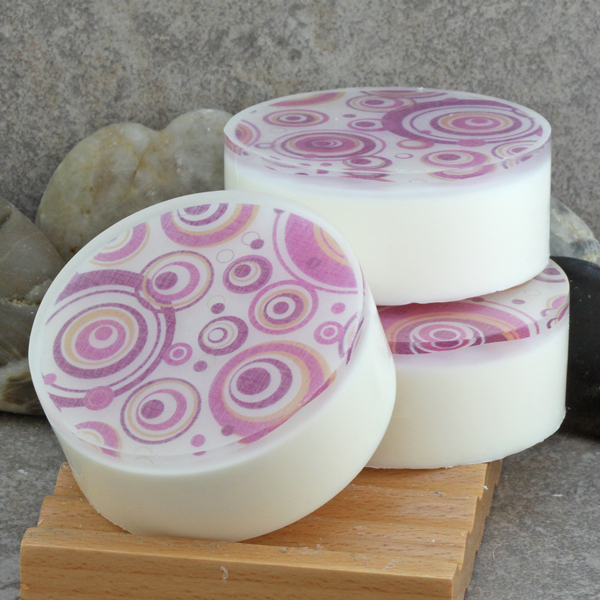 These soaps are created from high quality bases that contain no chemical detergents or lather enhancers. They produce a wonderful creamy lather and are gentle to the skin. The above design was create with the artwork of Michelle Alexis Smith of Rome, Italy. Her artwork can be found at PainterlyPapers on Etsy. Beautiful pale blue flowers peaking out behind green vines. This soap was scented with a sweet floral Hawaiian Lei fragrance and layered with coordinating colors of white, blue and green. The above design was created with artwork by Robin Sampson of Tennessee. Various shades of pinks and orange in circular patterns. Scented with one of my favorite fragrances, Sparking Citrus Sangria on a white base. More artistic soaps coming soon.